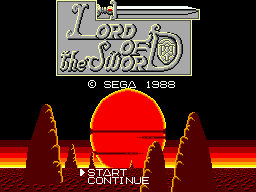 Lord of the Sword, known as Lord of Sword (ロードオブソード) in Japan, is an action RPG developed and published by Sega for the Sega Master System. The player assumes the role of Landau, who must prove his worthiness to a council of elders and defeat the forces of the usurper Ra Goan. The game takes place in a sword-and-sorcery fantasy setting. There is a series of villages where the player can restore their health and buy upgrades. Between the villages is a variety of terrains occupied by enemies, which are fought using a sword and a bow and arrows. Main article: Lord of the Sword/Magazine articles.